In some ways this has been a tricky call. 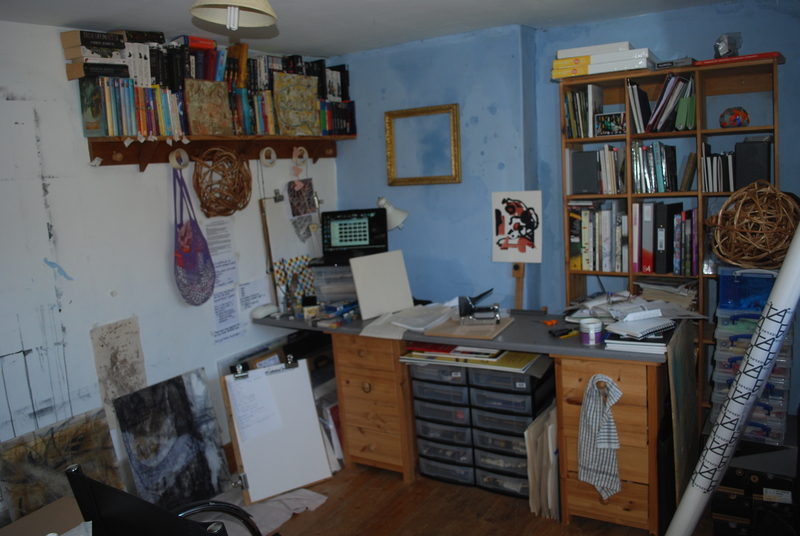 After Jake left home I had already been using what had been his bedroom as a space to work. Following his death it became a very emotionally loaded space, and once again piled up with his belongings. I had a lot of ‘dealing with things’ to do before I could work in the space, but I have now got pass that, though aware of the constant reminders around me of his presence. 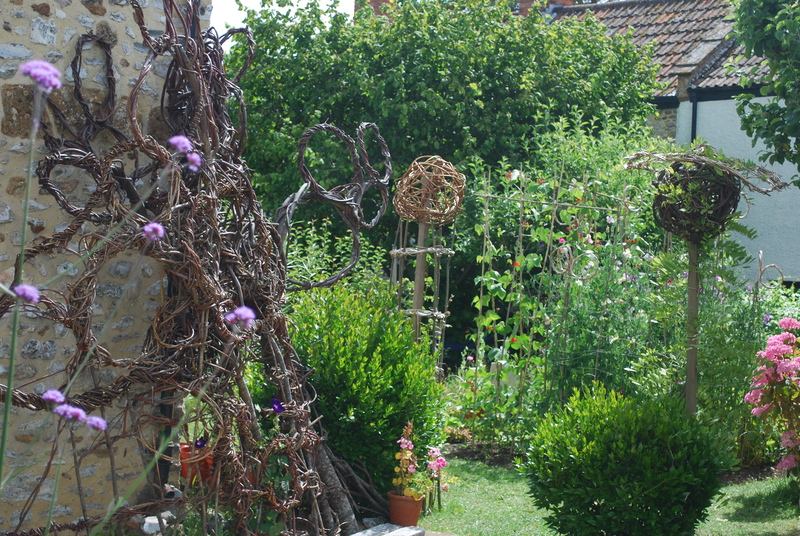 Where I have found myself working with willow, quite often I find myself working outside and consider the garden as almost an extension to my studio space. A short review and Cosmos Mind Map. I feel I need to approach this a little differently to suggested bearing in mind the unusual circumstances around my beginnings to the course. Through the additional tutorial provided by the OCA you have seen how I have been working with, drawing and photographing the willow. 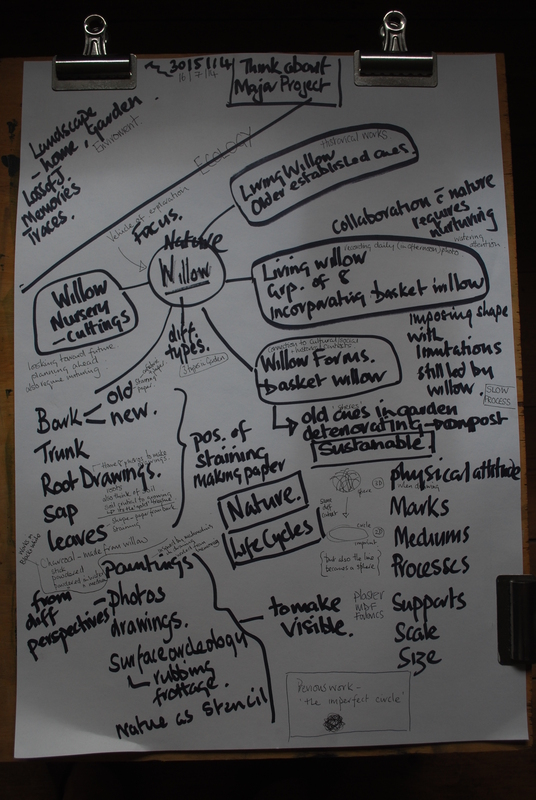 I made a kind of mind-map to help visualise the possibilities of working with the willow. I have also made a gallery on my blog to hopefully easily illustrate the different aspects of what I have been doing. I will make a gallery relating to this experimentation. What I haven’t done following on from our last discussion is to make some really big drawings, relating to the physicality of working with the willow. I did get my big roll of paper and it is something I intend to explore. The living willow sculptures add a different perspective to consider. In contrast to the observation of nature, it requires a negotiation with nature- the form I can achieve has its limitations that are wholly led by how the willow grows. A way of working in collaboration with nature that requires an element of nurturing and the out come will be reflective of how well that is done, which in turn requires an understanding of its needs. The nature of these works is also slow. Dependant on the turn around of the seasons, when in the winter months the new growth can be tied woven back in. I have started to photo graph the group of 8 living willows each day, at around the same time of day, so that they may be used as a slideshow that would show the changes in growth over time and the changes in climate/lighting, but may also serve as source material for making drawings. When I re-potted 2 of the willows so they are all in the same colour of pot, I made photographs of their root systems. This inspired me to take photos of the roots of each of the willows. I intend to make drawings from these, so that I will have one that refers to each willow. I have already been using the stencil made from my previous root drawing to explore its possibilities. I am starting to see the possibilities of a series of 8 works here, one relating to each of the willows, and possibly a larger work relating to the group. At this time though I am keen to remain open about where it goes. Demonstration of technical and visual skill. Am aware that recent experiments with materials have meant I have done less drawing. I think the change over to different course format has taken up some time in re-adjustment to the new requirements, but I think I might be there now. In terms of the out comes expected for part one I think I have hopefully presented it in a way that communicates well what I have been doing and hope to achieve. I have added a gallery to my blog so that a viewer can quickly get an overview of my work to date. I have done a significant amount of experimentation leading up to this assessment around the use of materials, but still need to work on how they may be best applied. Have done a lot of looking at other artists work in relation to my own, and thoughts about where and how my own practice may sit in the contemporary art world. Deep reflection about my work at the moment brings it challenges in the light of my recent loss.